Today, fire-rated glazing comes in many forms, including prominent curtain wall installations such as expansive storefronts, and large multi-storey glazed curtain walls. 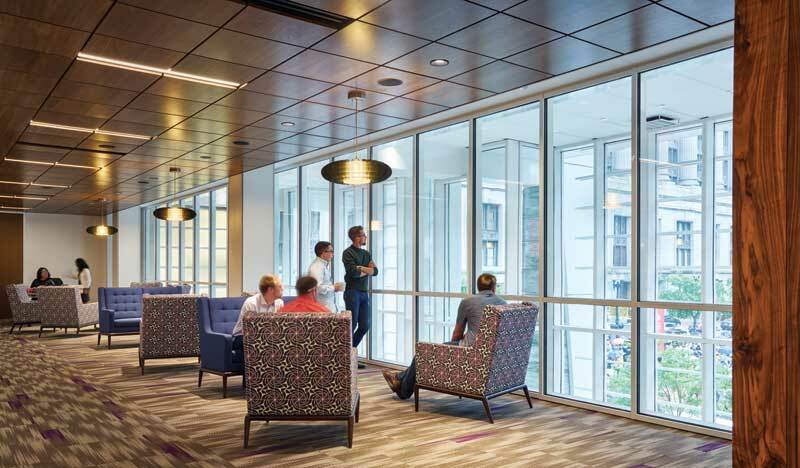 Fire-rated curtain walls defend against the spread of flames and smoke, and protect against radiant and conductive heat transfer, while allowing design professionals to create visually open, light-filled spaces. What makes up a fire-rated curtain wall system? Fire-rated curtain walls are carefully engineered and manufactured systems including fire-resistive glass, framing, and other components designed and confirmed through testing to work together. The fire-resistive glazing used in fire-rated curtain wall systems is usually made of layers of low-iron float glass with an intumescent interlayer. Such multi-laminate products are available with fire ratings of up to 120 minutes, and pass mandatory fire and hose stream tests. Fire-rated curtain wall frames typically comprise narrow-profile steel back mullions; there is the option for either outside pressure plates or frame-free silicone glazed exterior finishes. As with the multi-laminate glazing, the frames are available with fire ratings of up to 120 minutes, and protect occupants and property against heat transfer during a fire. All parts of the assembly—glass, frames, and other components—must meet the minimum fire rating for the entire system, in accordance with the National Building Code of Canada (NBC). This ensure the curtain wall system provides the targeted level of fire-resistance. CAN4-S106-M, Standard Method for Fire Tests of Window and Glass Block Assemblies. Fire-rated glazed curtain walls are available with 45-, 60-, and 120-minute fire ratings, can be used in interior and exterior applications, as the assemblies are air- and water-pressure tested and approved for the rigours of exterior use. building façades for structures in close proximity to one another. A notable North American project demonstrating the dual fire-resistive and light access traits of fire-rated curtain walls is the renovation of the Grant Thornton Tower in Chicago. The architect, VOA Associates, wanted to open up a 25.6-m (84-ft) long two-hour, fire-rated drywall partition to allow visual access to a two-storey lobby below, as well as out to the street. To accomplish this, the team replaced the partition with approximately 76.3 m2 (821 sf) of two-hour fire-resistive curtain wall frames and glass.